Here at Continuous Business Planning, we work with small businesses from start up right through to their eventual trade sale. There are two stages at which small business owners typically approach us to work with us; in the pre-start up stage when trying to get finance and when preparing their businesses for sale. We believe that where we can help add value in the process of preparing a business for sale is to plug the profit leaks in their business and make it as profitable and as valuable as possible in as short a space of time as possible. When called upon to do this, the first place we start with is pricing. More than any other area of a business, pricing can have an immediate, dramatic effect on the profitability of a small business. We find that small business owners are often very good at saving money and running their businesses in a "lean" manner but when it comes to setting prices, which is ultimately how businesses and their owners are compensated for their hard work and their financial risk, many small business owners have dropped the ball. Pricing decisions are often given very little thought and small businesses are short changing themselves every day. Most business improvement initiatives require a degree of capital investment and a "seed to harvest" period to determine just how well the effort has paid off. 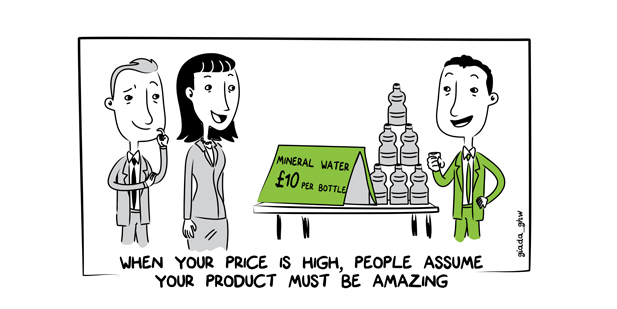 Altering a pricing strategy is easy to implement and can have immediate effect. I've seen plenty of small businesses change prices on Sunday night and see new profits flowing in the next morning. Small increases can make significant differences as well. A company that I worked with that operated with a healthy 20% profit margin was able to increase it's prices across the board by an average of 4%. This led to a 20% increase in operating profits as costs and demand remained constant following the pricing review. That change alone significantly increased the value of his business which he was preparing for sale, as well as putting more money in his pocket in the run up to that transaction. I give clients that are struggling with this idea of increasing prices a copy of a great book by Rafi Mohammed called "The 1% WIndfall". This book outlines in a very accessible way not only the remarkable benefits of even small incremental price increases but also a broad range of different approaches to pricing from which a better pricing strategy for their business can be first understood and then applied. Rafi Mohammed quotes from a study by McKinsey & Company of the Global 1200, which showed that if they increased their prices by just 1%, and demand remained constant, on average each company's operating profits would increase by 11%. He illustrated the full net benefits of this 1% increase using Wal-Mart as an example. In 2008, Wal Mart had net income of $13.4 Billion and a price to earnings (P/E) ratio of 14.56. That gives a rough market capitalisation of $195 billion. A 1% increase in the study would lead to a more than 18% increase in annual net income ($2.6 billion). This would increase the market capitalisation or total vale of Wal-Mart as the net income would be higher. On a new net income of $16 billion at a P/E ratio of 14.56, the new market capitalisation would be almost £233 billion, an increase of almost $38 billion. So we see that a 1% price increase at Wal-Mart would have led to a $38 billion dollar windfall. Now I deal with small UK businesses, not multi national behemoths such as Wal-Mart, but the underlying principle is the same. Powerful results can come from small changes. When I am told by a reluctant small business owner that they couldn't possibly put up prices, my immediate response is, "could you put up prices by 1%?". 99 times out of 100, the answer is "yes". However, many small business owners don't believe that a 1% increase could possibly make any difference. Small price increases can and do make powerful differences. Huge sums of money are being left on the table and companies are significantly undervalued due to poor pricing policy. Could some of these strategies unlock hidden profits in your small business? I am 100% sure that these strategies could deliver at least a 1% uplift in sales for you and your business and hopefully I have convinced you of the huge value of small increases in price. If you want assistance in plugging profit leaks in your business and in claiming some of that money that is being left on the table every day, as well as maximising the value of your business, then contact us today. Here at Continuous Business Planning, our passion is your profit.